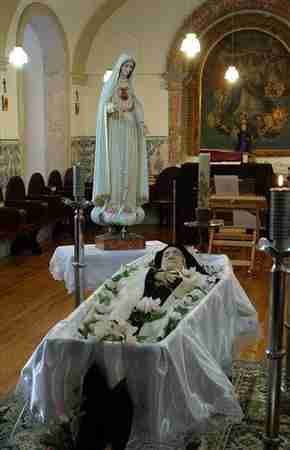 Lisbon, Feb. 14, 2005 (CNA) - Sister Lucia, the last surviving witness of the three children to whom the Virgin Mary appeared at Fatima, Portugal, died Sunday at the age of 97. 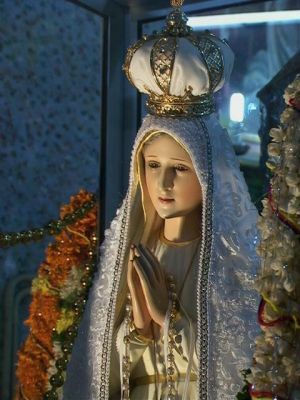 Her passing occurred on the 13th day of the month, which was always the day on which the historic apparitions of Mary took place. According to the Portuguese news agency Lusa, Sister Maria Lucia of the Immaculate Heart, born in 1907 as Lucia de Jesus dos Santos, died of old age at the Carmelite convent of St. Teresa of Coimbra in central Portugal, at 5:25pm local time. The local bishop, Antonio Cleto, will officiate at the funeral rites at the Cathedral of Coimbra. The bishop of Leiria-Fatima will also be present. Sister Lucia will be buried at the same Carmelite convent that had been her home since 1948 and where she was visited by Pope John Paul II during one of his visits to Portugal. Lucia was born on March 22, 1907, in a town near Fatima where, at the age of ten, she saw the Virgin Mary for the first time at Cova de Iria, while she was with her cousins, Francisco and Jacinta Martos, who both died at a young age. Lucia went to elementary school in the town of Vilar, near Oporto in northern Portugal, and in 1928 she moved to the Spanish town of Tui, where she lived for several years. In 1946 she returned to Portugal and two years later entered the Carmelite convent of St. Teresa of Coimbra, where she made her first profession in 1949. Pope John Paul II beatified Francisco and Jacinta Marto in 2000 in a celebration attended by more than 700,000 people. Their cause for canonization is currently under consideration. 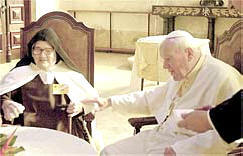 Pope John Paul II has said he was deeply moved when he heard that Carmelite Sister Lucia dos Santos, the last surviving Fatima visionary, "was called by the heavenly Father to his eternal dwelling place". Sr Lucia died in the Carmelite cloister in Coimbra, Portugal, on Sunday at the age of 97. "I remember with emotion the various meetings I had with her and the bonds of spiritual friendship that intensified with the passing of time," Pope John Paul said. "I always felt supported by the daily gift of her prayers, especially in difficult moments of trial and suffering," the pope wrote in a message to Bishop Albino Mamede Cleto of Coimbra. "May the Lord repay her abundantly for the great and hidden service she gave the church," the pope wrote in the message, released on Tuesday at the Vatican. 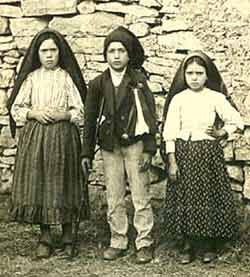 The Portuguese girl was only 10 years old when she and her two younger cousins claimed they saw the Blessed Virgin Mary at Fatima in 1917. He travelled to Fatima in 2000 to beatify Francisco and Jacinta, and steps are expected to be taken to beatify Sister Lucia as well.